This brilliant thriller stars Ethan Hawke as Hank, a divorced father whose dire financial straits lead to him getting involved in a scheme concocted by his equally desperate older brother Andy (Philip Seymour Hoffman), whereby they rob a jewellery store owned by their parents (Albert Finney and Rosemary Harris). However, when the heist goes horribly wrong, both brothers are left frantically trying to conceal their involvement as events spiral out of their control. Life is particularly difficult for Andy because he's been embezzling funds from his accounting firm in order to fund a severe drug habit and he's about to be audited. And as if that wasn't bad enough, to complicate things still further, Hank is having an affair with Andy's wife (Marisa Tomei). Directed by 83-year-old Sidney Lumet, he truly creates a masterpiece of modern cinema as he draws some terrific performances from his actors and orchestrates some superbly suspenseful sequences. He's aided by a note-perfect script from first time screenwriter Kelly Masterson, which cleverly plays with the film's structure and chronology by replaying various scenes from different perspectives. Philip Seymour Hoffman is sensational as Andy, a desperate man whose rapid unraveling is genuinely terrifying to watch. Ethan Hawke has the less showy part by comparison but he's equally good and there's also strong support from both Albert Finney and Marisa Tome. 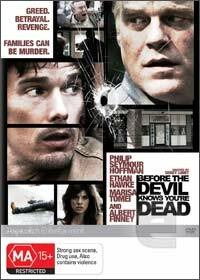 Before the Devil Knows You’re Dead is a hugely suspenseful, emotionally devastating thriller with impeccable direction and terrific performances from Hoffman and Hawke.